Built around a 22-inch touch-screen display, the all-black, all-in-one desktop “panel" with its wireless keyboard and mouse is a sleek home desktop PC. You also get a TV-like remote for multimedia operations. The CPU-panel-screen stands 21 inches tall, 17.4 inches high and a mere 2.6 inches deep and comes pre-installed with Windows Vista Home Premium. At the networking and connectivity end, the Touchsmart has 10Base-T/100Base-TX/1000Base-T RJ-45 Ethernet, 802.11b/g/n Wi-Fi, Bluetooth, five USB 2.0 ports and IEEE 1394 FireWire. The 5-in-1 card reader supports Memory Sticks/Memory Stick Pro, MMC, SD and SDHC cards. Also integrated into the fascia of the piano-black screen frame are a Web camera, headphone socket, an audio line-out, audio line-in, a microphone and an SPDIF out jack. Installing the Touchsmart is a breeze. A Home button launches HP’s customized touch interface. The Touchsmart 2’s touch screen shows much improvement over its previous version in terms of sensitivity and responsiveness. The 1,680x1,050 resolution screen display is extremely sharp, crisp and bright. Vivid hues, very good saturation, clarity at all viewing angles and the large screen factor makes video-watching a real pleasure. 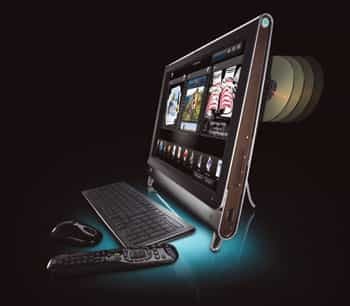 In fact, the respectable 22-inch screen ensures that you can be seated a fair distance away to watch TV. Large (actually huge) program icons on the desktop enhance functionality in terms of both touch-screen operation and using the mouse from far away. The twin high-definition speakers concealed in the grill mesh below the screen deliver superb sound as far as clarity goes. However, the loudness and volume levels are a little disappointing at times—especially if you keep in mind that the “distant viewing and operability" are a major USP of this machine. The five-button mouse and the keyboard are ergonomic, lightweight yet well-built. The keyboard lacks any form of lighting. To compensate, there is a button on the side of the PC panel that lights up a soft white fluorescent tube under the monitor for you to see what you are typing in dark environs. But this is effective only when you are seated right next to it. Untethered wireless interactivity with the CPU in terms of not just the keyboard and mouse, but also the remote, ensures that you don’t need to be just 2-3ft away from the PC to perform a number of operations. So, be it playing music, viewing photos and videos, checking email or even the weather—you can easily do all that from a fair distance. Instead of a built-in power supply, the Touchsmart comes with a laptop-like adapter on its lengthy power cable. Along with Vista, the Touchsmart brings Adobe Reader 8.0, Muvee autoProducer, Microsoft Works 9.0, and Norton Internet Security 2008 (60 days subscription) pre-installed. Also handy is the special HP Touchscreen application. With the forthcoming version of Windows promising an enhancement in its touch-screen skills, you can be sure that PCs such as the Touchsmart are slowly and steadily going to get more mainstream. Yet, until programs and their user interfaces start tapping and exploiting the inherent potential of touch technology, there won’t be any paradigm shift in everyday computing. The Touchsmart 2 is by far the neatest looking Windows home desktop PC you can buy currently. Is it worth that big price tag? Well, it’s got the looks, it’s got the meat. If you can afford it, you should go for it.